Marco Polo is a fun app that lets you send and receive videos– a video “walkie-talkie.” The app only gives you the ability to save videos that you sent. But on an iPhone or iPad it’s possible to save videos that other people sent you by using iOS’s screen recording function. Here’s how to download a Marco Polo as a video into your iPhone or iPad photo library (and save on your computer if you want). Then go to Marco Polo. Pull up the control center by swiping up from the bottom of the screen. Play the Polo – the sound will be recorded too. Swipe up to bring up control center, stop recording. The video is saved in your Photos library. You can send it to your computer via Airdrop. How to take off the filter housing is quite simple: fill the pitcher with soap and water, flip it upside down and the housing should just slip off. The important part is to fill up the bottom of the pitcher, leaving the top empty. 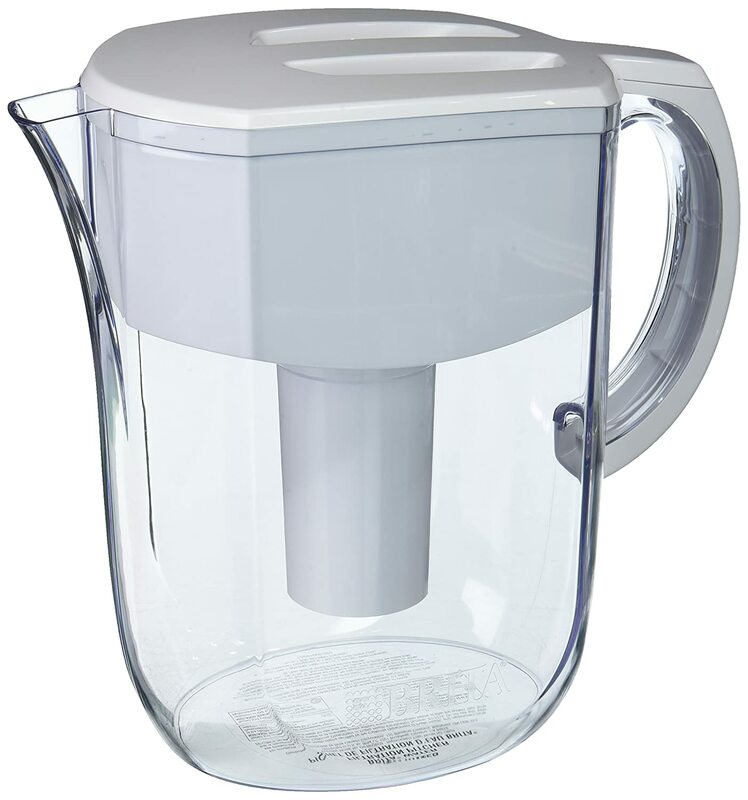 When you flip the pitcher upside down, the weight of the water will make the white plastic insert pop out. Update: This eventually became too hard, since the insert can stick, and make it hard to remove. I bought a ZeroWater pitcher and am quite happy with it, it’s easy to disassemble for cleaning. This is a quick note about how to remove and block Monero crypto-currency mining WordPress malware. Symptom: You run WordPress on your Linux web server and its CPU is at 100% but it should not be. The cron.php is allowing a backdoor to let bots run mining malware on your server. The /tmp/phprScAj0_j3oku523wjamvhep program is a Monero crypto-currency miner, making money for someone who broke into your system. Remove the file or the offending block of code. If the file only contains malware (a large eval block) just delete it. These are not ico files, they have a php back door embedded in them. Look in wp-config.php for any weird looking includes – maybe including an ico file like the ones listed above. If you find any, remove them. You are done! – Watch your CPU graphs to make sure you really deleted it and it doesn’t come back. I am not sure all the steps are needed, but this worked for me and keeps the bots out. I hope it helps someone else. I noticed that Google Analytics for WordPress has Shopp eCommerce plugin support that enables conversion tracking, but it doesn’t work on Shopp v1.2.9, the version I have. I have a fix for this problem – I applied this fix and it works on my site. I submitted this to the plugin author, Joost van de Valk via Yoast.com but he hasn’t gotten back to me, so I’m posting this in case it helps someone else. This is part of a series of posts about building an Orone Mini, a Maple Mini clone that is designed to be easier to build by hobbyists. It primarily uses surface mount technology, and there are a couple of fine-pitch (0.5mm) devices, so it’s not easy to solder by hand. 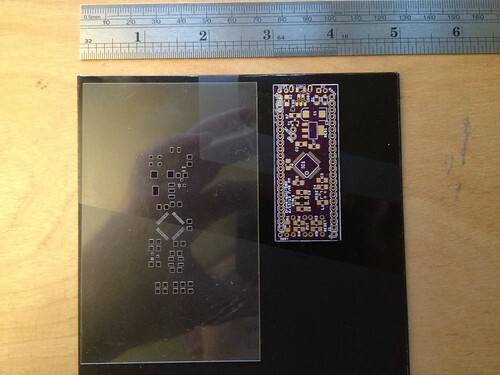 This means I need to use a solder stencil. I want to make my own stencils, since I want faster turnaround time. But how to do it? 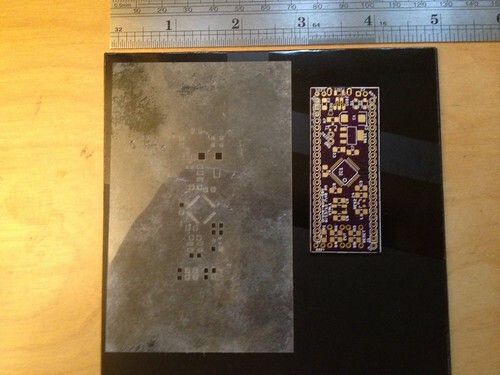 Adafruit has a great tutorial on making SMT stencils, but the final output step uses a laser cutter. 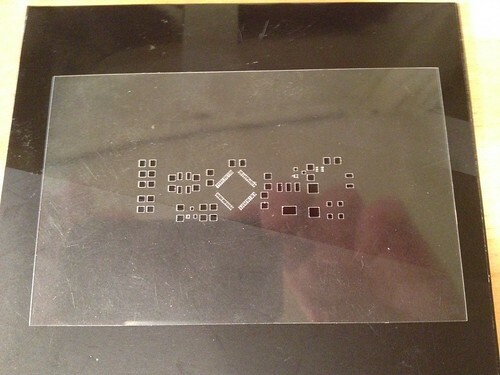 I don’t want to buy a laser cutter, since they’re in the thousands of dollars – making my own laser stencil cutter is cool, but right now I don’t have the time for it. Making aluminum stencils also sounds cool but I don’t want to mess around with muriatic acid and other chemicals each time I want to make one. On Hack A Day I heard about using a vinyl cutter to cut stencils which linked to Peter Monta’s wonderful program gerber2graphtec. This is a command line program that takes gerber files output by an EDA program (in my case, Eagle) and turns them into something that the inexpensive Silhoutte Cameo stencil cutter can understand. 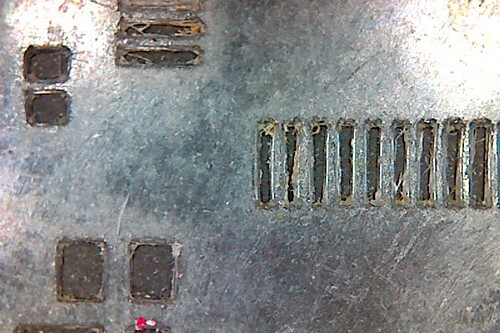 You can get more info on Peter Monta’s SMT Stencil Cutting blog post, or this one at DM Studios on stencil cutting. 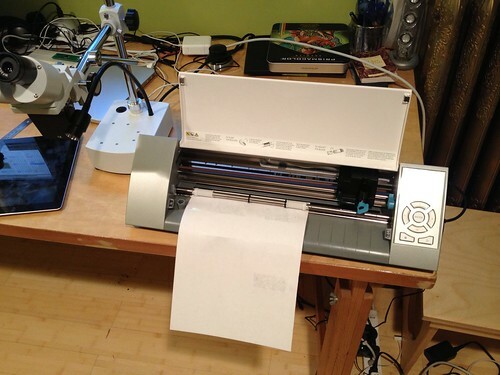 Graphtec Silhouette Cameo stencil cutter bundle – $270 as of the writing of this blog post, much less expensive than a laser cutter. This is pretty much exactly as Peter Monta explains in his SMT stencil cutting blog post. I tried some of the other ways he thought might work – using the cutting mat instead of the full sheet label, or using spray-on removable adhesive. But these weren’t as successful – I think the Avery labels stick well and keep the plastic film from bending while the cutting is going on. 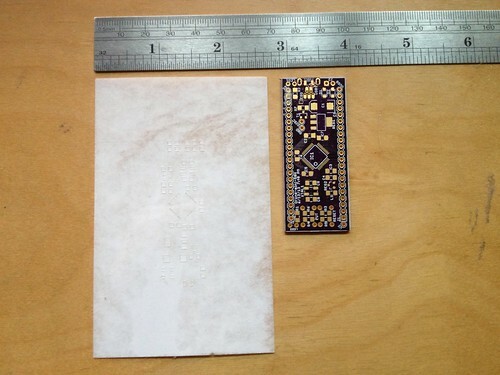 Use an EDA tools to produce the solder stencil layer (tcream layer in Eagle) gerber files as in the Adafruit SMT stencil tutorial. 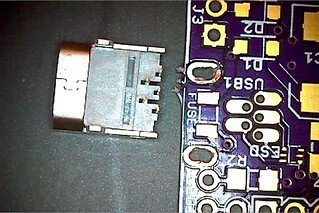 I use a 1-mil shrink – that is, I shrink all the pads by 1 mil so the solder paste doesn’t overflow too much. 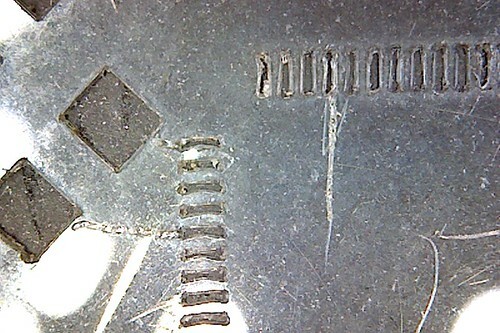 This is a compromise – I’d really like to shrink by 3 or 4 mils, but the stencil cutter doesn’t produce perfect holes if I shrink the fine-pitch pads that much, and the solder paste I’m using (lead-free Kester NXP) doesn’t go through the small holes that well. 1-mil shrink seems to work fine. --offset 4.0,0.5 suitable for letter size (portrait) on the Cameo, fed as "media" not "mat"
Process the tcream gerber file to make a file that can be sent to the Silhouette Cameo (.gtec file). These settings are for a 0.5 inch bounding box around the board outline; gerber2graphtec calculates the border from the bounding box of the stencil, which may not be the edge of the board. I’m adding an offset so the stencil is cut into the right edge of the sheet. I’m using 3 passes with increasing force – with three passes I can get almost perfect cut-outs of the fine-pitch pads. When I went to the 3-pass using a fresh sheet, my fine-pitch diagonal pads look like this too. Success! I’m building a Maple Mini clone called the Orone Mini S8H as practice for building an Open Source EEG board. The Orone Mini is a board designed by Garry Bulmer in the UK. 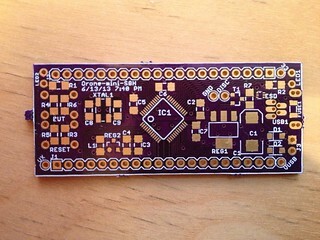 It’s software compatible with the Maple Mini but designed to be more easily made at home by hobbyists – it’s a two-layer board, and mainly uses larger 1206 size SMD components, on one side of the board only. Here’s a couple of articles about it: Improving the Maple Mini Part 1, Improving the Maple Mini Part 2. Here’s the Maple Mini specifications. I’ll post updates on my progress here as I go along – so stay tuned! 46.105.113.8 - - [14/Apr/2013:22:57:20 -0400] "POST /blog//wp-login.php HTTP/1.1" 200 4115 "-" "Mozilla/5.0 (X11; U; Linux i686; pt-BR; rv:1.9.0.15) Gecko/20091028 15 Ubuntu/9.04 (jaunty) Firefox/3.0.15" 74.207.229.103 - - [14/Apr/2013:22:57:20 -0400] "POST /wp-cron.php?doing_wp_cron=1365994640.1665890216827392578125 HTTP/1.0" 200 222 "-" "WordPress/3.5.1; http://adamfeuer.com"
74.207.229.103 - - [14/Apr/2013:22:57:20 -0400] "POST /wp-cron.php?doing_wp_cron=1365994640.1665890216827392578125 HTTP/1.0" 200 222 "-" "WordPress/3.5.1; http://adamfeuer.com"
So what to do? I looked around for an article on how to protect myself from the botnet, but didn’t find any good ones. So that’s why I’m writing this article. If you only have one or a few WordPress sites to protect, as the article I link to above mentions, it looks like you can install a plugin to protect you. Both these will automatically block logins from IPs after a certain number of failed login attempts. I haven’t tried either yet. I wanted a solution that would work for all the WordPress sites on my server. That meant something at the Apache configuration level, or in the OS. I’m running Ubuntu 12.04. Here’s what I did, and it seems to work – this solution will block all attempts to log into WordPress except from a whitelisted IP address. Install Apache mod_security – mod_security is an Apache module that helps prevent attacks like this, and does a lot of other cool security stuff. Find out your IP address of your home network – one way is to type “What is my IP address” into Google. Replace the 1.2.3.4 with your home IP address. You can have multiple lines like this if you access your WordPress site from multiple IP addresses. You are done. If you want, you can check your Apache logs to see there’s now 403 error codes being returned for the botnet requests. The solution isn’t perfect, since you still get lots of “403 – Forbidden” log entries, but it’s better than leaving your WordPress site vulnerable. Update: after I whitelisted my home IP, the botnet seems to have given up – after about 15 minutes the requests stopped coming. Update: I posted the question and answer to Stack Overflow, since that will probably get more traffic than this blog post: How do I protect my WordPress/Apache website from a brute-force botnet attack? You can install the Amazon Library Linky Chrome extension from the Chrome Store. I ported the Amazon SPL Linky Greasemonkey script to Chrome and made it a proper Chrome Extension. This extension can search any Bibliocommons library, and has an options page where you can select which library you want to search. All of the participating Bibliocommons libraries are supported (about 50). [Update:] You can see the source code here: Amazon Library Linky on Github. If you try it out, will you let me know how it works for you? Here’s how to make it so clicking the Page Action icon of a Chrome extension opens the extension options page. This code will open a new options page if one is not open, or switch to it if it’s already option. // the tab as a result of the user pressing the browser action. // Called when the user clicks on the browser action icon.